There are flexible ways to set up rental pricing in our equipment rental software – EZRentOut. In addition to specifying rental rates for individual assets/asset stock items, separate rental rates for items in bundles can also be set. With this setting, the actual rental rates of items (asset or asset stock) in a bundle are used to calculate the price of bundles. Bundle-level discounts are applied on the total rental price calculated for the rental duration of each item in a bundle. Adding discount value to a Bundle: You can set discount pricing for bundles when creating a new bundle or make changes to an existing one. 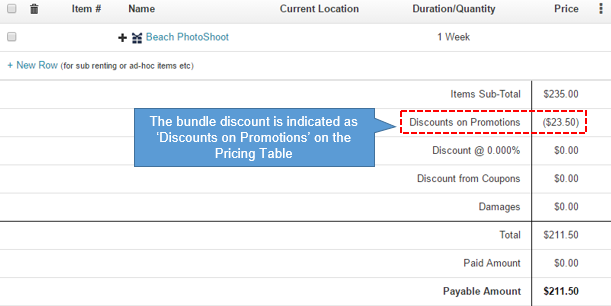 Go to Bundles > Click Bundle name > Edit and select ‘Discounts’ under ‘Bundle Pricing’ to set a discount value e.g. 10% for that bundle. This value may be set to zero if the original rental rates are to be used for all items in that bundle. Note: This discount is not applied on inventory items included in a bundle. Flat Pricing for Bundles based on Rental Periods: Flat bundle pricing can be used to set separate rental pricing for bundles and override the rental rates of individual items (asset or asset stock) in the bundle. For example, a bundle containing a camera, a tripod and a lens can have an overall rental pricing of $8 per hour, $13 per day and $75 per week. Note that this rental pricing does not apply to items that are for sale (inventory items). 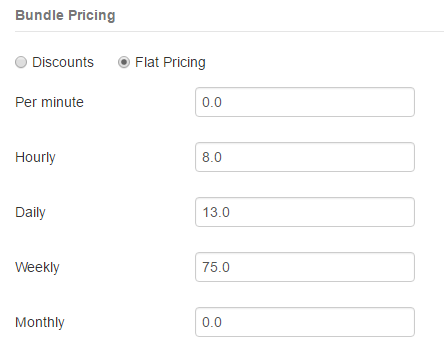 You can set pricing for bundles for per minute, hourly, daily, weekly or monthly go to Bundles > Click Bundle Name > Edit and select ‘Flat Pricing’ under Bundle Pricing. When bundle pricing is set to ‘Flat Pricing’ in our equipment rental software, you can specify the percentage of rental cost shared by each rental item. There are two ways to assign the percentage of rental cost shared by each item in a bundle when flat bundle pricing is specified i.e. either assign an equal share of the rent to all items or assign separate percentage shares to each item. To assign an equal share of the rental price to each item in a bundle simply select ‘Assign equal share to each item’ under ‘Items in the Bundle’ within the bundle details page as shown below. If the ‘Beach Photoshoot’ bundle is rented out for 1 week with its flat pricing set to $75/week then the total cost of the bundle is $75. In this case, the rental price of the camera is 70% of the total price i.e. 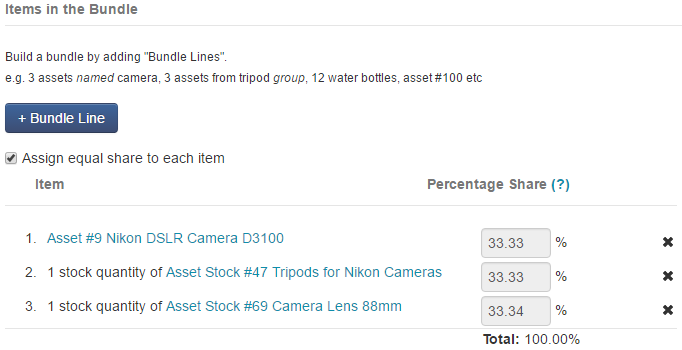 $52.5, the Tripod is $18.75 and the Lens is $3.75. The percentage must be divided accordingly or the bundle won’t play out. An incorrect percentage is highlighted and an error is also indicated. Note: Inventory items are sold so they are not assigned a percentage for rental pricing. Their cost is simply added to the total of the rental items in the bundle. When bundles with flat pricing are added to an order, the rental price of each item is calculated according to the percentage of rent that each bundle item contributes. The price of each item is rounded off to the second decimal place. Sometimes the rental price of items cannot be perfectly rounded to two decimal places which results in a rounding error. To learn more about adding bundles to orders, click here. EZRentOut is the leading equipment rental software used by a diverse set of rental businesses worldwide. This entry was posted in [Support], Feature Release, productivity and tagged bundle pricing, bundles, discount pricing, flat pricing by admin. Bookmark the permalink.